Following the passport dramas at Ankara train station, we were finally able to relax on the Toros Express bound for Adana in Eastern Turkey as we followed our route into Syria. 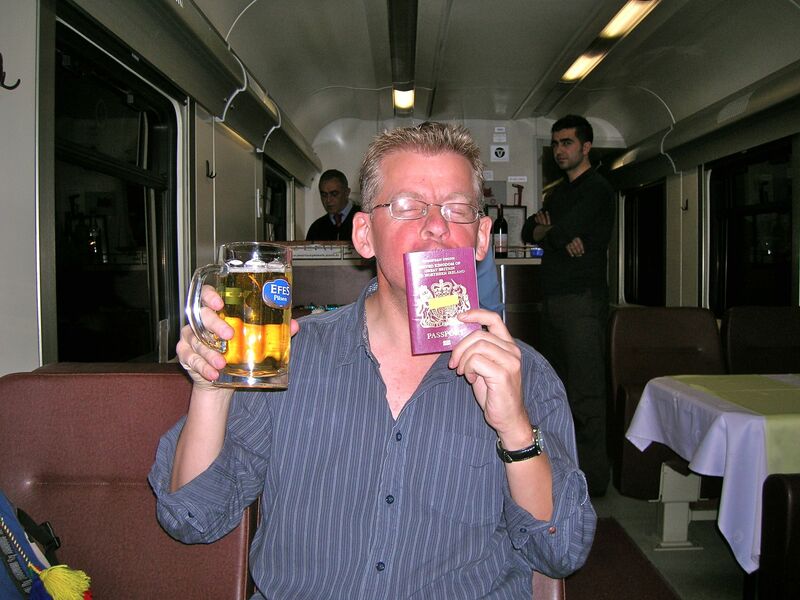 After dumping our gear in our sleeper compartment, we shuttled off to the restaurant car for a beer to celebrate the happy ending to our ordeal. Feeling a bit peckish we perused the menu. There is something really special about eating in the restaurant car of a train. I automatically think of Alan Wicker and Murder on the Orient Express, tuxedos, pianists & champagne etc. whenever I frequent one at night. This wasn’t nearly as salubrious as all that, but at least we had only slightly stained white tablecloths and matching napkins. The not so smartly dressed waiter took our orders – lamb stew for me, rice with cheese for Hamish. His choice was not an official menu item, but in the absence of veggie options he negotiated a meal of the rice from the stew dish and the cheese from the cheeseburgers. My meal was delicious, but Hamish’s was pretty unexciting – bland rice with a processed cheese square plonked on top. Beer munchies were suitably assuaged however, so it was time for bed with a shared beer nightcap. We had gone for the deluxe cabin, the one with the tiny sink with a lid that folds down on top to create a storage space. Turkish Rail had kindly provided us with free disposable toothbrush and miniature tube of toothpaste, a tiny bar of soap, a plastic comb and bottle of water. There was not too much space to manoeuvre in, especially with our luggage, but by pre-communicating our every move we managed to avoid bashing into each other. A great feat for clumsy me especially! We soon drifted off to the soothing sound of wheels on tracks. No loco changes or passport controls to worry about, so a good night’s sleep was there for the taking. I stirred around six, feeling that we were moving really slowly. Something compelled me to look out of the window. We were high up in the mountains in a snowy landscape. This now rates as Hamish’s best wake up call ever. We dressed hurriedly, grabbed our cameras and went off to record the scene through the windows. Most were iced up, but we found sufficient gaps for some decent pictures. As I listened to Grieg’s Peer Gynt once more in a winter wonderland, my mind drifted as it usually did listening to this piece. My audio delight was augmented with the visual so I was soon imagining trolls warming themselves by a fire in their caves and mischievous sprites having snowball fights in the forest. Since then I only have to listen to the opening bars of ‘Morning’ to be instantly transported back to that snowy mountain scene viewed on my magical train ride, which managed to supplant my more normal vision of that Fauske to Narvik bus journey seventeen years earlier. We were in the Toros Mountains, which we should have traversed through about four when it would have been pitch black. We were running late, but this was definitely to our advantage for once. A quick wash in the lidded sink and it was off to the restaurant car again for breakfast. Here we remained for a good couple of hours. We both went for ‘special breakfast’ of hard (and I mean hard) boiled egg, bread roll (harder than the egg), gherkin, tomato, soft cheese triangle, apricot jam portion, butter, watery orange juice and unlimited coffee. We ate the lot, despite both snapping our plastic knife trying to spread the rock solid butter on the roll! As we drank our coffee, we recalled the dramas from the previous evening and contemplated what might have been. We could now be waking up in a grotty hotel in Ankara with a feeling of foreboding about what events would unfurl that day or we could still have been blissfully unaware of the traumas that lay ahead as we tucked into our fodder. Perhaps worst of all, we could now be tearing up the train compartment desperately trying to locate the wallet or even imploring the train guard to conduct a search of all passengers and their belongings. Maybe the policeman in Ankara would also have been contemplating what to spend his windfall on whilst laughing at the picture of my big-eared mate! 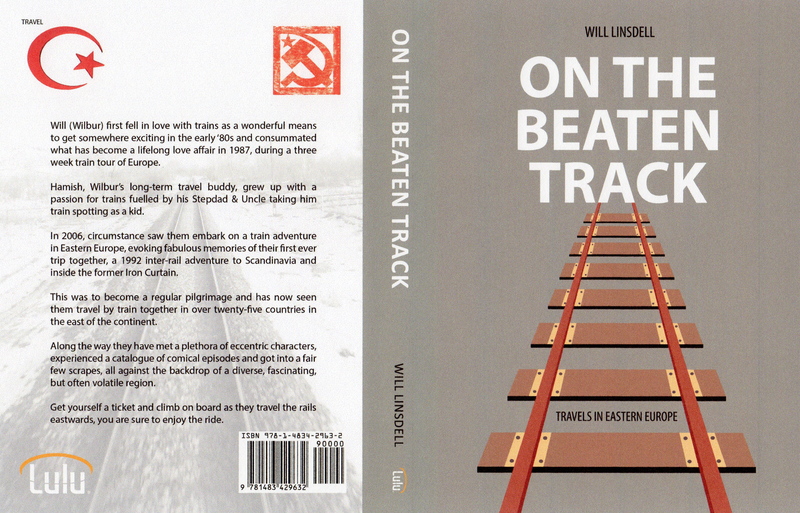 The whole of the journey to the Syrian border features in my published book ‘On The Beaten Track – Travels In Eastern Europe’ featuring travels in 25 countries in the Eastern portion of Europe. You can download it for less than £2 from Amazon.